Discussion in 'Online Games - News and Reviews' started by Marina, Jan 20, 2015.
and experience before you play for cash. Here are three of the most unique online scratch cards that could be dug up, as well as were you can find them to play for fun or for real cash. NetEnt created this cop and robber-themed scratcher, and the graphics are befitting of their top-quality brand. It’s a 3-dollar ticket, and you have the chance to win up to 150,000 by matching three images. clever animations and enjoy fast, as well as smooth, gameplay. Hall of Fame is available at CasinoLuck and you can play it free if you feel like checking it out. maximum will net you 10,000-times your wager. 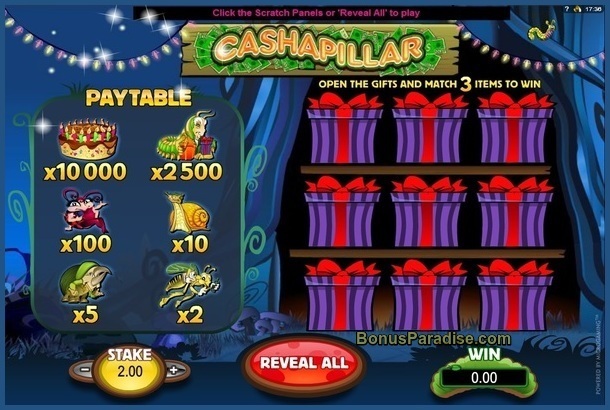 Cashapillar is available at Guts Casino, as well as other select Microgaming casinos. to locate at least two of the six pieces of treasure. You can bet as much as 10 dollars for a chance to win 100,000 dollars, or as little as 10 cents, with a jackpot of 1,000 dollars when you find all six. regions to choose from and the dynamite explodes when you choose one, before it reveals your prize. Treasure Hunt is available for cash and free-play at Vera&John Casino, as well as a few others which specialize in NetEnt games. Online slots are fantastic, and they are loaded with great features these days. However, sometimes it’s nice to take a break from the action and play something a little more straightforward. Online scratch cards deliver a similar experience and can be played quickly as well. If you haven’t tried any of the new designs lately, you might be surprised as to how far the games have come.